Buffalo Technology seems to have won the race as the first vendor to actually ship a USB 3.0 hard drive. The company announced Tuesday that it is shipping its new SuperSpeed USB 3.0 external DriveStation HD-HXU3. Tapping into the speed of the new USB 3.0 spec, the drive can push data at least three times faster than a USB 2.0 drive. 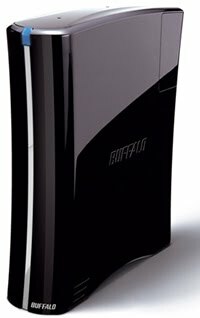 Available in 1-terabyte, 1.5TB, and 2TB capacities, the drive is backward-compatible with existing USB 2.0 computers, said Buffalo. The company is also releasing a two-port USB 3.0 PCI card, so users can upgrade their desktop PCs to take advantage of the drive's higher speeds. Since the USB 3.0 Promoter Group finalized the new USB 3.0 standard about a year ago, vendors have been pushing to get their new products out the door. Buffalo had been dueling with Netherlands-based company Freecom to actually deliver the first USB 3.0 hard drive to consumers, not just announce it. Freecom had issued a press release promoting its own USB 3.0 drive in September. That drive was supposed to be available in Europe by mid-November, but I was unable to find any European vendors selling it online. Responding to an earlier request for comment, a Freecom representative said that samples of the drive were sent to some PC manufacturers and key customers this month. But due to an order backlog, the drive would not generally be available to all customers until next year. With its higher transfer rates, the new USB standard is ideal for moving around large images as well as huge audio and video streams. As such, USB 3.0 is seen as competition for other high-speed transfer technologies, such as eSATA and FireWire. Though USB 3.0 offers a theoretical maximum burst rate of 625MB or 4.8 gigabits per second, neither the Buffalo nor Freecom drive will come close to that mark at this point. Freecom has rated its drive at 130 megabits per second while a Buffalo representative told me his company's drive would average around 120Mbps. USB 3.0 has been promoted as offering speeds up to 10 times faster than USB 2.0. But manufacturers will need time to rev up their new drives to approach that threshold. When will the new Buffalo drive actually hit the stores? The company rep said it's now shipping to online vendor Microcenter and should be available for purchase the week of December 7. Estimated prices are $199 for the 1TB, $249 for the 1.5TB, and $399 for the 2TB.